Tony writes in the preface that this is his story and as such he does not use a ghost writer in any way. The book keeps a light conversational tone as Tony starts out by telling the tales of his childhood business dealings and works up from his failed worm farm to founding LinkExchange, which he sold to Microsoft. From there, Tony talks about using the money to invest in other ventures until he helped fund Zappos and transitions to leading the company and working through its trials and tribulations. While Tony talks about social media tools, it’s never the crux of his story. From the beginning, Tony is focuses on the culture and enjoying the work and what you do. When LinkExchange scaled up too quickly, the culture changed and it became a culture of money rather than a culture based on the friendships that founded the company. Everything Tony does after that, he is careful not to keep the culture up beat, to the point where it becomes a major focus of the company. Even now, Zappos is a culture of fun and enjoyment for all the employees, where work and fun tend to meld together and employees consider each other family. The other major point of focus for Zappos is customer service. To Tony, it isn’t just important that the employees love the company, but that the customers do too. They go out of their way to do things for people. It may be something as simple as allowing a person to return a pair of shoes that they don’t like or don’t fit right, with Zappos paying for the shipping, or doing a free upgrade of the shipping on a pair of shoes. Anyone can ask any question of the 24/7 customer service system and the employee will entertain any questions or silliness that people asking the questions may ask of the employee, as evidenced by examples in the book. When a new person joins Zappos, they go through an educational regiment that lasts a couple weeks. At the end of which, the new hire is offerred $2,000 plus accrued salary for that time period. If the person takes it, they are considered someone who wanted to join the company for money and would not have been a proper fit in Zappos. If they stay on, they spend a week or two doing customer service, to get a feel for how Zappos culture operates and to get a feel for the customers of Zappos. 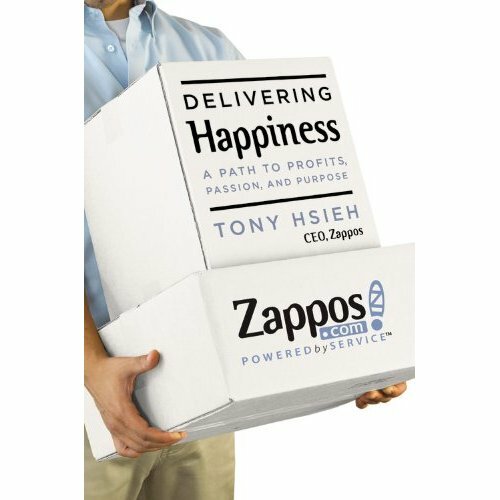 Once the culture and customer service of Zappos is ingrained, the person goes to do the job they were hired for, but can continue to increase their education through classes from Zappos and to read books from a library in the Zappos offices. While many other authors and businesses are all about Twitter, Facebook and other social media tools, Zappos is about people. Tony’s story in Delivering Happiness is never fully about business but about treating people right and how the culture of being happy and good to other people can build a billion dollar business. Taking the story from a completely different perspective gives a refreshing look at business and at Tony’s personal story.